Few things ruin a nice dinner out like a visibly dirty dish. A long wait because the dishwasher’s backed up comes close. While no one chooses a restaurant or café with their dishwasher in mind, it actually plays a pretty big role in the kind of experience a patron will have. Trying to skimp on buying a good commercial dishwasher for your establishment could come back to bite you. It should be easy to use so your staff don’t have issues or require complicated training to figure it out. It should work fast enough that your kitchen never has to wait on a clean dish in order to get food out to your customers. It should meet all sanitary requirements so you don’t risk a health code violation. It should get your dishes clean enough that no patron will feel they’re eating off something that’s less than pristine. If you can find one that does all that without making too much noise or using too much energy, then you’ve pretty much hit the jackpot. Whatever commercial dishwasher you buy has to manage the basics, but what’s required to manage the basics will vary for different commercial kitchens and some models can provide extra benefits beyond just the things you need it to do. 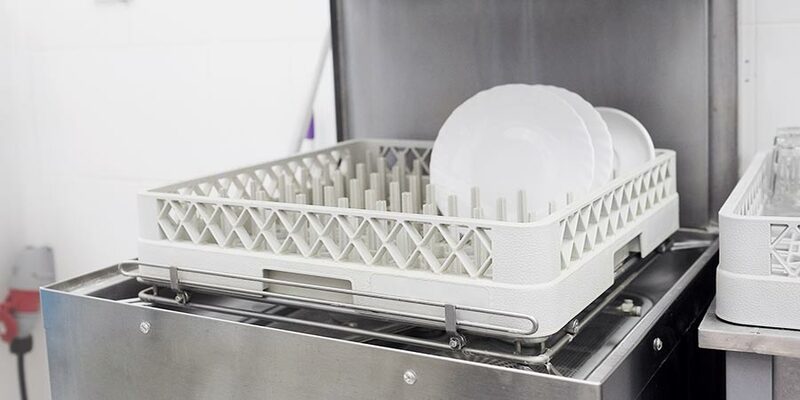 If it’s time to buy a new commercial dishwasher for your kitchen, here are the main things you should know to ensure you find the best one for you. Commercial dishwashers fall into four main types of categories. Figuring out which type will work best for you is essential to getting the best dishwasher possible. Let’s take a closer look at the pros and cons of each type. Undercounter commercial dishwashers are the best choice for bars, coffee shops, or smaller restaurants that don’t have much space to give to a dishwasher. The flip-side to the space savings, as you would guess, is that these dishwashers don’t hold the same quantity of dishes as some of the larger types available for commercial use. If you run a high-capacity commercial kitchen that needs clean dishes quickly, an undercounter dishwasher may end up slowing things down. Undercounter models are like the stepping-stone between residential dishwashers and commercial ones. They sometimes look similar to residential dishwashers and offer similar features, but they can work faster and hold more dishes than machines made for home kitchens. Don’t take up much space. Easy to install & allows counter space on top. Most affordable type of commercial dishwasher. Only fits a limited number of dishes. Glasses are more fragile than other types of dishes and, as such, kitchens and bars that have a lot of them may benefit from glasswashers that combine the power of commercial dishwasher with gentle enough water flow to keep even the most sensitive types of glassware, like wine and martini glasses, from breaking. You can typically use glasswashers for any other dishes you need washed as well – they’re not exclusively for sensitive glasses, they’re just specially made to handle those specialty glasses exceedingly well. Glasswashers often come in undercounter styles which are comparably priced to other types of undercounter dishwashers, but they can come in other styles occasionally which cost more. They come in especially handy in bars that go through glasses quickly. If you need clean glassware without the wait, then this is probably the best commercial dishwasher for you. Can wash thin and special glasses without damage. Can wash many other types of dishes as well. Not as useful for kitchens that need to clean large pots and pans regularly. Door type commercial dishwashers have a large door on their front that you can leave open until the point where you’ve filled a rack, slide it in to the machine, close the door, and retrieve clean dishes a few moments later. They’re designed to be fast and efficient. The ideal dishwasher for busy kitchens. They have higher capacities that most undercounter models and tend to take up more space. They also usually use more water and energy than other types of dishwashers, which should be taken into consideration while shopping. Even so, this is easily one of the best commercial dishwashers for kitchens that need that extra speed and capacity — which is most of them. 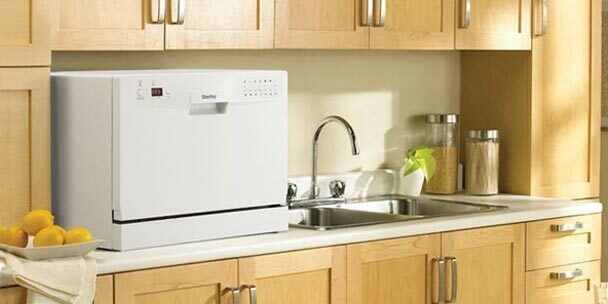 In fact, door type commercial dishwashers are the most common choice for commercial kitchens. Often more expensive than other dishwasher types. Use more energy and water. 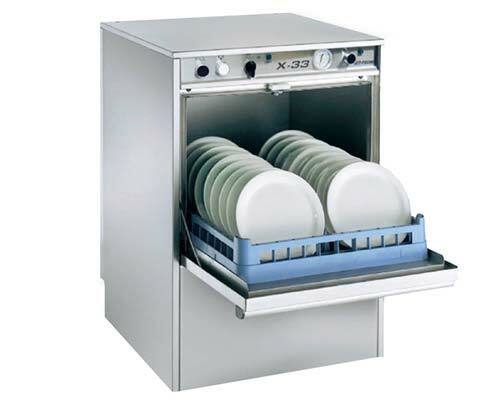 Conveyor type dishwashers offer the highest capacity of any dishwasher type on this list. They also take up the most space, so don’t think you can cram one into a commercial kitchen that’s already tight on space. Tends to be more expensive. Take up a lot of space; not the best fit for small kitchens. You have a lot of practical considerations to make in order to ensure you choose a commercial dishwasher that meets your needs. The right one can make your kitchen run more smoothly and contribute to increased profits, but the wrong one can end up costing you more than you afford, lead to decreased efficiency in your kitchen, or taking up more space than your employees can easily work around. For commercial kitchens, the stakes are actually pretty high. Here’s what you need to take into account before making a purchase. There are a lucky few in the world who can make purchases without considering costs, but you’re probably not one of them. Whether you’re running a restaurant, cafeteria, coffee shop, or bar, you probably have a strict budget you have to stick to. You have to find the right balance between what you can afford to spend and what you need. For many smaller establishments, affordable undercounter dishwashers will do the trick. For a cafeteria serving a large hospital, trying to get by with an undercounter model instead of a conveyor one would likely be a disaster. Most restaurants will fall somewhere in between the two extremes and want to shell out for a mid-priced door type dishwasher. The upfront cost isn’t all you need to think about though. Most restaurant dishwashers will require professional installation. They’ll all use energy and water in significant quantities. You can certainly find models that far better on energy and water use than comparably sized ones if you want to save money over time, but you’ll likely need to spend a bit more upfront. If you end up with broken glassware because you decide to send it through a traditional commercial dishwasher rather than glasswasher, that’s an additional expense you’ll need to account for as well. Finally, if your dishwasher is too slow or provides too small of a capacity, then your lost customers could cost you more than the upfront costs of a more expensive model. Size and capacity should be given at least as much weight in your considerations as cost. First things first, it doesn’t make any sense to buy a commercial dishwasher that you can’t fit into the space you have. Before you even start browsing your options, measure your space. Commercial kitchens are usually busy, crowded places with lots of people in them. In addition to the practical concern of whether the dishwasher will fit, you also need to consider if where you’re placing it will be in the way of the people working in the kitchen. Will it be possible for people to continue doing their jobs in an efficient way with the dishwasher in the allotted spot, taking up the amount of space it will (along with one or more people doing the work to fill it). How big your commercial dishwasher is will usually directly relate to how many dishes it can hold at a time. As you likely know without being told, this is an extremely important consideration. If your dishwasher can’t wash enough dishes at once, your customers will deal with longer wait times. Obviously, it can be tricky figuring out how to fit a high-capacity dishwasher into a small, crowded space. You may have to make a trade-off for either more dishes or a more crowded space. Do your best to figure out how to best ensure all meets are met. Somebody’s going to be loading and running that dishwasher every day, several times a day. If it’s difficult to figure out or clunky to use, that will become a problem. Manufacturers know how busy commercial kitchens get, so industrial dishwashers are generally designed with efficiency top of mind. Even so, some models will be harder to use if put into a space they’re not well designed for. Before making a purchase, think through what the process of loading and running it will look like in your kitchen. Try to imagine anything that might end up being difficult on your staff or slow down the process. And consider if there are any features that might add to ease of use, like how well the racks are designed for fast loading and what settings the dishwasher offers. Commercial kitchens move fast. Your dishwasher needs to keep up the speed. Capacity is part of this — the more dishes you can fit into one load, the lower the frequency with which you need to run the machine to keep a steady stream of dishes clean. 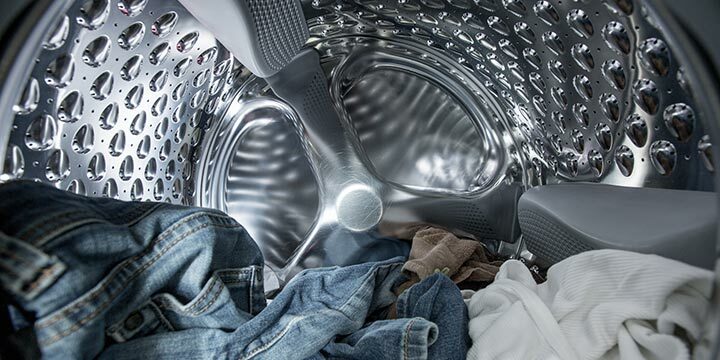 The other main part of the equation is how long a wash cycle lasts. Most commercial dishwashers are pretty fast. The speed of a cycle is one of the main things that sets undercounter dishwashers apart from their home kitchen counterparts — your home dishwasher probably takes 30-45 minutes, where an undercounter one will finish a cycle within a minute or two. For most kitchens, the difference between a one-minute cycle and a two-minute one probably won’t make that much of a practical difference in how your kitchen runs, but you do want to be aware of how long the dishwasher will take so you’re sure to buy one that’s fast enough. Commercial dishwashers come in high-temperature and low-temperature varieties. High-temperature dishwashers use heat to sanitize dishes, rinsing them at 180° Fahrenheit to ensure they’re fully sanitized. Low-temperature machines can’t get the water that hot, so users instead have to turn to chemicals to make sure the dishes are sanitized. There’s not a clear consensus on which option is better than the other, although high-temperature industrial dishwashers are more common. 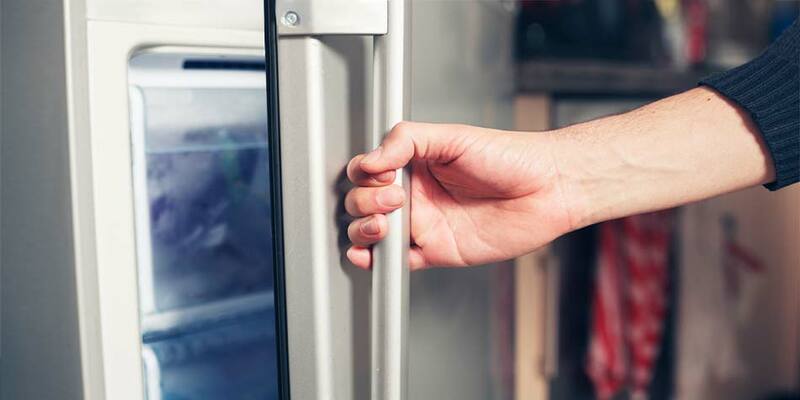 High-temperature models cost more upfront and require more energy ongoing, but the dishes dry faster and you don’t have to purchase sanitizing chemicals on a regular basis. Low-temperature models cost less upfront and save you money on energy bills, but you have to consider the cost of buying more chemicals at regular intervals and they tend to damage certain types of dishes, which means you’ll have to purchase new ones more frequently. Environmentally speaking, high-temperature models are generally considered better in spite of their higher energy use because you won’t be dumping chemicals into the drainage system. And high-temperature models also tend to clean dishes better on the whole. Most commercial dishwashers are loud. And the more powerful they are, the louder you can expect them to be. You can find a few smaller undercounter models that are comparably quite quiet, which can come in handy for smaller establishments that need to keep the dishwasher close to where patrons eat and drink. With conveyor and door type dishwashers, you’re going to have to accept some noise. 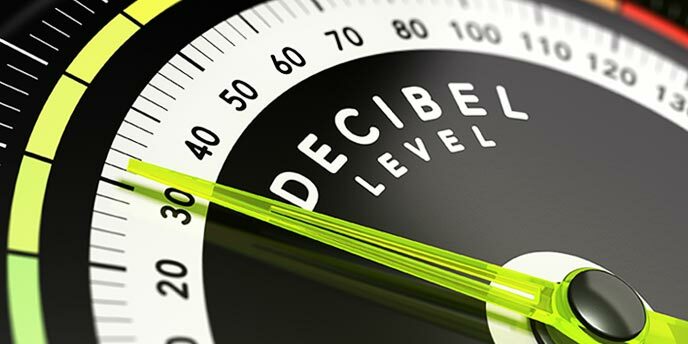 If you’re concerned about the noise output of the machine you choose, check reviews and product specs to see if decibel ratings are given. In some kitchens, the noise can be accepted as a cost of doing business, but if you’ll be putting the dishwasher in a space where extremely loud noise would be a problem, you should consider the comparison between your different options before making a decision. You can’t wash dishes without power and water. As with noise, expecting a restaurant dishwasher to add costs to your water and energy bills is simply par for the course. Yet you can absolutely find models designed with energy efficiency in mind. Some come with low-energy settings you can use when appropriate to reduce costs and many are specially designed to use less energy when idling between cycles. If you’re concerned about the potential energy usage of your commercial dishwasher, look for the Energy Star certification. Machines that earn it have been found to be 40% more energy efficient and use 40% less water. You need to make sure your kitchen space is prepared for the commercial dishwasher you purchase. 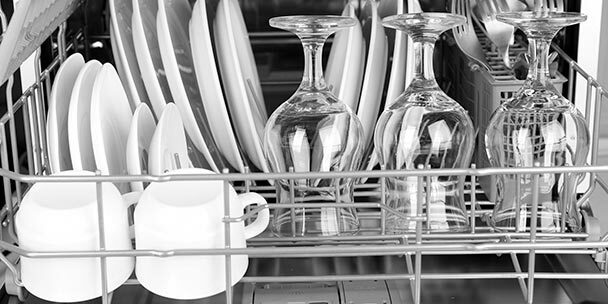 Dishwashers use a lot of energy and if your electrical system isn’t designed to offer the proper voltage, you risk blowing a fuse or not being able to use your dishwasher at all. Check your local codes to make sure you understand the drainage requirements. You can’t just put your dishwasher anywhere, you need to have the right pipes and drains nearby for everything to work and be within code. If you’re not replacing a similar model, you’ll probably need to call in an electrician and/or plumber to get the space updated for use of a new commercial dishwasher. Not all dishwashers get hot enough to meet sanitation standards, so in some cases you’ll need to consider purchasing a booster heater as well. They can also help you dry your dishes faster. Make sure you get dish racks that make sense for the types of dishes used in your establishment. You need to be able to fit everything that needs to be washed in your racks and make sure you have enough racks to send the most commonly used items through at the frequency levels required. One of the final factors you should consider before purchasing a commercial dishwasher is the reputation of the brand. A good commercial dishwasher should work consistently and endure regular use for years to come. Going with a brand known for quality products will help ensure you get that from your appliance. To give you an idea of what to expect from some of the top brands in the market, we looked at what people had to say about commercial dishwashers sold by each online in order to bring you a summary. CMA Dishmachines makes a variety of commercial dishwashers including undercounter, door type, and glass washer models. Reviewers say their machines are user friendly, solidly built, and work fast, making them good for busy kitchens (which applies to most commercial kitchens). One reviewer mentioned their machine was slow to drain, but otherwise the response to their dishwashers is positive. Fagor’s a brand with a fairly solid reputation for making commercial appliances. The reviews we found of their commercial dishwashers suggested that they’re easy to use and don’t take up much space in the kitchen. Jackson’s commercial dishwashers have a strong reputation for working well, washing dishes fast and being built to last. One reviewer described having a great customer service experience when a part needed to be repaired, so even if you do have problems you can expect to be well taken care of. Jet-Tech makes commercial dishwashers of different type that get mostly positive reviews from customers. Reviewers say they’re fast, have strong pressure, and can be counted on to last a long time. A couple of reviews mentioned the machines being difficult to learn how to use and slow to drain, so they weren’t all straight praises, but more reviewers than not were pleased with the purchase. Miele’s a familiar name in appliances that sells commercial dishwashers customers are happy with. They’re quiet, efficient, and effective. The only negative that came up in reviews is that their dishwashers are on the pricier side. If you have the budget for them, many customers are happy with their investment. Clean dishes aren’t optional for any establishment that serves few, and most can’t afford to spend much time getting those dishes clean. Picking the right commercial dishwasher will make a big difference in how efficiently your kitchen is run and how quickly you can serve your customer during a rush (and get your staff out of the door come closing time). They’ll get a lot of use and make a big difference in how a day-in-the-life of your kitchen staff goes, so be careful to make sure you get the dishwasher that makes the most sense for your kitchen. We are looking for a commercial dishwasher for our church kitchen. We need one that will wash plates, flatware, and glasses as well. We probably also need one that isn’t hard to use, as many different people will be in the kitchen loading and running it. Typical Wednesday “free lunch” count is about 70. If we have an after-church dinner, we might serve 100 people. Any suggestions? Our current dishwasher is dead as a doornail. Also — do we need one of those instant water heaters? Lease a single rack Low temp DW. You only need 120 to 145 degrees to sanitize using chlorine. You should be able to do 3 meals per rack and a rack in 60 to 75 seconds. You should figure .03 to .05 cent per rack. Some companies will lease a commercial machine with the first 1500 racks included, that’s 500 meals. I did not realize that there were so many different dishwashers to choose from depending on the situation and use of the dishwasher. Like you mentioned, an under-counter dishwasher would be used in a residential setting, while the other types of dishwashers are used more in a commercial setting. Either way, I think that it would be important to consider what you are going to use it for and how often it will be used before you buy it. I have the dream of one day opening a restaurant. In order to make this happen, I need to know what commercial dishwasher to get. 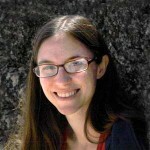 Thanks for the tips on how to choose the best one to improve efficiency. I hadn’t thought of the potential need of a booster heater to help dry dishes faster. I love how you mentioned the importance of measuring the space available when looking for a dishwasher. It makes sense that doing this can help you save a ton of time and make sure you choose the best machine that will meet your needs. We are building a house and want to make sure we choose the best machine but have not decided what type we need, this post helped a lot though. Thank you. We are getting ready to open a high in wine bar and will have many expensive crystal wine glasses of different shapes and sizes, will this dishwasher work for this? Is it noisy as it will be in the bar near the dining room?